The National Cadet Corps is Youth Wing of Armed Forces with its Headquarters at New Delhi, Delhi, India. It is open to school and college students on voluntary basis. National Cadet Corps is a Tri-Services Organization, comprising the Army, Navy and Air Wing, engaged in grooming the youth of the country into disciplined and patriotic citizens. The National Cadet Corps in India is a voluntary organization which recruits cadets from high schools, colleges and universities all over India. The Cadets are given basic military training in small arms and parades. The officers and cadets have no liability for active military service once they complete their course. The NCC is the world's largest uniformed youth organization. Its motto is 'Unity and Discipline'. The NCC in India was formed the National Cadet Corps Act of 1948. It was raised on 15 be traced back to the ‘Corps’, which was created under the Indian Defence Act 1917, with the objective to make up the shortage of the Army. In 1920, when the Indian Territorial Act was passed, the ‘University Corps’ was replaced by the University Training Corps (UTC). The aim was to raise the status of the UTC and make it more attractive to the youth. The UTC Officers and cadets dressed like the army. It was a significant step towards the Indianisation of armed forces. It was rechristened in the form of UOTC so the National Cadet Corps can be considered as a successor of the University Officers Training Corps (UOTC) which was established by the British Government in 1942. During World War II, the UOTC never came up to the expectations set by the British. This led to the idea that some better schemes should be formed, which could train more young men in a better way, even during peace. A committee headed by H N KUNZRU recommended a cadet organization to be established in schools and colleges at a national level. The National Cadet Corps Act was accepted by the Governor General and on 15 July 1948 the National Cadet Corps came into existence. During Indo-Pakistani war of 1965 & Bangladesh-Pakistani war of 1971, NCC cadets were second line of defence. They organized camp to assist ordnance factories, supplying arms and ammunition to the front and also were used as patrol parties to capture enemy paratroopers. The NCC cadets also worked hand in hand with the Civil defence authorities and actively took part in rescue works and traffic control. After 1965 and 1971 wars NCC syllabus was revised. Rather than just being second line of defence, NCC syllabus laid greater stress on developing quality of leadership and officer like qualities. The military training which the NCC cadets received was reduced and greater importance was given to other areas like social service and youth management. The discussion for motto of NCC was started in 11th central advisory meeting(CAD) held on 11 August 1978. At that time there were many mottos in mind like "Duty and Discipline"; "Duty, Unity and Discipline"; "Duty and Unity"; "Unity and Discipline". later, at the 12thCAD meeting on 12 Oct 1980 they selected and declared "Unity and Discipline" as motto for the NCC. In living up to its motto, the NCC strives to be and is one of the greatest cohesive forces of the nation, bringing together the youth hailing from different parts of the country and moulding them into united, secular and disciplined citizens of the nation. The Aims of the NCC was laid out in 1988, NCC aims at developing discipline, character, brotherhood, the spirit of adventure and ideals of selfless service amongst young citizens. Not only these, it also aims to enlighten leadership qualities among the youth who will serve the Nation regardless of which career they choose. It also motivates the young to choose a career in armed forces. In 1954 the existing tricolor flag was introduced. The three colours in the flag depict the three services in the Corps, red for Army, deep blue for Navy and light blue for the Air Force. The letters NCC and the NCC crest in gold in the middle of the flag encircled by a wreath of lotus, give the flag a colourful look and a distinct identity. Each lotus represents one NCC Directorate(Dte). The two dots represent the Officer Training Academies at Gwalior, Madhya Pradesh and Kamptee, Maharashtra. do solemnly pledge that we shall always uphold the unity of India. We resolve to be disciplined and responsible citizens of our nation.
" Ham Sabh Bhartiya Hain". "Ham Sabh Bhartiya Hain" - NCC song is written by Sudarshan Faakir. Directorate - There are 17 Directorates located in the state capitals headed by an officer of the rank of a Maj Gen from the three Services. Group - Depending upon the size of the state and growth of NCC in the states, Directorates have up to 14 Group Headquarters under them through which they exercise their command and control of the organisation in the state. Each group is headed by an officer of the rank of Brigadier or equivalent known as Group Commander. Battalion- Each NCC Group Headquarters control 5-7 units(Bns) commanded by Colonel/Lt.Col or equivalent. Company - Each Battalion consists of companies which are commanded by the Associate NCC Officer(ANO) of the rank of lieutenant to major. In all there are 96 Group Headquarters in the country who exercise control over a network of 684 Army wing units (including technical and girls unit), 60 Naval wing units and 61 Air Squadrons. There are two training establishments namely Officers Training School, Kamptee (Nagpur, Maharashtra) and Women Officers Training School, Gwalior. Besides this Vice Chancellor's of various universities across India are conferred with honorary rank of commandant in NCC, to promote and support NCC in their respective University. These 17 directorates are divided in total of 814 units divided in three service groups Army, Naval and Air. Out of those 684 are Army, 69 Naval and 61 Air units. Army: Each battalion or unit of NCC consists of a number of platoons or coy. For senior division boys each platoon consists of 52 cadets and each coy consists 160 cadets. Each BN has 4 to 7 coys so each BN carries around 640 to 1120 cadets. A senior wing girls BN consists of 2 to 7 coy means a total of 320 to 1120 cadets. For junior division boys and junior wing girls each troop has 100 cadets and each BN has at least one troop. Navy: For senior division boys each BN or unit consists of 4 to 8 divisions and each division consists of 50 cadets. For senior wing girls similar arrangement exists as of senior division boys. For junior division boys and junior wing girls each BN has a troop of 100 cadets. Air: For senior division boys and senior wing girls each unit consists of at least 2 fleets each consists of 100 cadets. So each unit known as Squadron carries around 200 cadets. For junior wing girls and junior division boys each squadron has a troop consisted of 100 cadets. However, each unit can have up to 24 troops of senior division boys expanding their strength to 2400 cadets but this is maximum limit. JD boys and JW girls are given ranks up to Company Sergeant Major (CSM) in Army. Only SD boys and SW girls are given ranks above CSM in Army. In Air Force & Navy JD boys and JW girls are given ranks up to Sergeant only and SD boys and SW girls are given ranks above Sergeant. The NCC directorates are headed by service officers of the rank of major general and equivalent; group headquarters are headed by service officers of the rank of brigadiers and equivalent, and units are headed by service officers of the rank of colonel(TS)/lieutenant colonel/major or equivalent. They are responsible for proper training, planning and execution of NCC activities. A cadre of whole time lady officers (WTLO) with cadre strength 110 officers has been sanctioned in 1995. They are to be commissioned partly through departmental channel and partly through UPSC in a phased manner. ANO is an important link in the NCC organization between the BN and the cadets. As amatter of fact, ANO is the feeder node of NCC since he / she is the one who is in direct contact with the cadets all throughout the year. There are two training establishments namely Officers Training Academy, Kamptee and Women Officers Training Academy, Gwalior. These two institutions trains the school and college teachers selected to head the company/troop. Courses in these institutions range from 21 days to 90 days in duration. Associate NCC officers are given following ranks according to their seniority and their training. Army cadets wear khaki uniform. Naval cadets wear white uniform of Navy. Air Force cadets wear light blue grey (LBG) uniform. The uniform is compulsory on all the occasions. Cadets from SD boys Army wing wear khaki full sleeve shirt and trousers & cadets from JD wear khaki shirt & khaki shorts. Girl cadets from SW & JW both wear khaki full sleeve shirt and trousers. Cadets from SD boys Naval wing wear white half sleeve shirt and white trousers & JD boys wear half sleeve white shirt and white shorts. Girls from Naval wing SW & JW wear white half sleeve shirt and trousers. Cadets from SD boys Air wing wear light blue half sleeve shirts and trousers & JD cadets wear light blue half sleeve shirts and trousers. Girls from SW and JW wear light blue half sleeve shirts and trouser. Total training period for SD and SW is 3 years with an extension of 1 year permissible & training period for JD & JW is of 2 years. Every cadet of the Senior or Junior Division has to undergo service training for a period of at least 4 hours per week during the training year. However, no training is carried out during periods when the college or school through which a cadet is enrolled is closed for a vacation. Every cadet of the Senior and Junior Division has undergo service training for a minimum period of 75% of total hours during the annual college and school session. 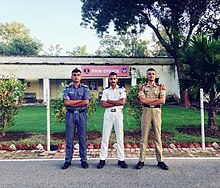 Every cadet (in case of JD, who has completed one full year of training and is in his second year) attends an annual training camp of 9–10 days, also known as National Combined Annual Training Camp. For SD/SW the duration is usually for up to 30 days. At the end of the camp training the cadets receive a certificate of successful completion. Certificate - A : It can be written by JD/ JW cadets of NCC, cadets of class 8 & 9. After passing those classes it can't be obtained. The candidate must have attended a minimum 75% of total training periods laid down in the syllabus for the first & second years of JD/JW NCC(All Wings). The candidate must have attended one Annual Training Camp. Certificate - B : It can be written by SD / SW cadets of NCC, cadets after class 10 & those studying for +2, +3 (degree). In the second year of training they can appear for the same. The candidate must have attended a minimum 75% of total training periods laid down in the syllabus for the first & second years of SD/SW NCC (All Wings). He/she must have attended one Annual Training Camp/NIC. Cadets possessing 'A' certificate will be awarded 10 bonuses marks. An air wing cadet must do a minimum 10 Glide launches. Certificate - C : It is the Most important certificate for NCC cadet. Now it can be written in the 3 rd year of training, in the 3rd year of degree course / those having B certificate can write it in the first year after his +2 and in the 1st year of degree by SD / SW cadets only. The candidate must be possessing a 'B' certificate. Must have attended two ATCs or one ATC and in addition to it RD Camp Delhi, Centrally Organised Camp, Para Training Camp, Attachment Training with service units, National Integration Camp, Youth Exchange Programme, Foreign Cruise(Navy). Three certificates are awarded (1) A grade, (2) B grade, (3) C grade. The best certificate is C, which has the highest value. (i) A cadet has to obtain 45% marks in each paper & 50% marks in the aggregate to pass the examination. Grading is based on total marks obtain will be awarded as follows. (aa) Grading 'A' - Cadets obtaining 80% marks and above. (ab) Grading 'B' - Cadets obtaining 65% marks and above but below 80%. (ac) Grading 'C' - Cadets obtaining 50% marks and above but below 65%. (ad) Fail - Cadets obtaining less than 45% in any paper or less than 50% in aggregate. NCC Republic Day Camp is the culmination of all NCC Training activities. RDC is held at Garrison Parade Ground, Delhi Cantt from 01 to 29 Jan. 1850 Selected NCC Cadets from 17 directorates attend the Camp. Every directorate has 5 to 7 units under them. The Camp is inaugurated by the Vice President of India and culminates with Prime Minister's Rally on 28 Jan.
During the camp visit of Raksha Mantri, Cabinet Ministers, Chief Minister of Delhi, three Service Chiefs and various State Ministers/VIPs are also organised. During the RDC, various competitions are conducted amongst the 17 NCC Directorates to decide the Champion Directorate for award of Prime Minister's Banner. Competitions are keenly contested in various events such as National Integration Awareness presentation, Drill, Line & Flag Area, Cultural Programs i.e. (group song, group dance & ballet), Best Cadet of Senior Division (Boys) and Senior Wing (Girls) in each Service - Army, Navy & Air Discipline and Best Cadet Boys and Girls each from Junior Wing. Aero modelling and Ship modelling are also conducted during RDC. In C.A.T.C., the boys(Senior & Junior Division)and girl cadets(Senior & Junior Wing)of a particular NCC unit participate in the 10-day camp. Classes are conducted as per the given syllabus wherein certain aspects of NCC training are taught once again. The camp acts as a refresher training for the cadets and they are also trained in basic skills of survival and emergencies besides other topics. They are taught certain skills pertaining specifically to their Wing for e.g., a Naval cadet is trained in boat-rowing, oaring, Semaphore, etc. Another activity in the camp is the "dogwatch" wherein two cadets are to stay on sentry duty for two hours at any time given time of the day. Those caught sleeping, especially during late night or early morning shifts, or otherwise missing from duty are severely reprimanded or penalized. Cadets are also introduced to weapons such as a .22 caliber rifle. NIC is to propagate national integration among cadets and society. 'Only the best cadets in drills and march are sent to represent their states. 'This camp is considered for SSLC and higher secondary course(+2) grace mark These camps are conducted on All India basis and help bridge the cultural gap among various States of India. In addition, there are six special NICs conducted at Leh, Nagrota (J&K), Chakabama (NER, Nagaland), Srinagar, Lakshadweep and Port Blair. In this camp cadets are taught leadership quality and stage daring. Advanced leadership camp is conducted in many places. in this camp the officers give cadets training for ssb screening and entrance. These camps are conducted by the NCC in collaboration with Indian Army, as the willing cadets are attached to the specific regiments undergoing the training period of 10–15 days. In this camp, the cadets are trained by the instructors of the particular regiment, in the military tactics including day/night warfare & also get familiar with the weaponry. They are full of adventure, Cadets who want to experience something adventurous must attend them. Create memories never forgotten. the cadet who wants to participate, have a good stamina for walking. This camp is full of adventure. Obstacle course - In which the obstacles includes 6-feet wall, zig-zag, double ditch, balancing, 3-feet bar, left bar, right bar, incline, etc. It is done after wearing full tactible gear with rifle. Firing - It consists of two types - Shooting (Grouping, Snap-shooting & Application). It is done with a standard .22 caliber rifle at the range of 25 meters & 50 meters. Map Reading - which includes working with compass, service protector & a map. Field craft & battle craft. This centrally organised to camp is organised for Air Wing Cadets. Cadets from all directorates attend the camp. VSC is generally conducted in the month of October at Jodhpur. This centrally organised Naval Camp is conducted annually for selected Naval Wing Cadets. Boat pulling, semaphore, whaler rigging, drill competitions are the main attraction of the camp. It is generally held at Naval Maritime Academy (NAMAC) at Visakhapatnam but started to be held at Karwar from 2014. This centrally organised Naval Camp is conducted annually for selected Naval Wing Cadets. Yachting (Sailing) is the main attraction of the camp. It is generally held at Naval Base INS-Chilka at Odisha. Naval wing syllabus is common for both boys and girls. During sea training naval subjects like Seamanship, Navigation, Communication, Gunnery, Damage Control and Ship Safety are taught to cadets. Swimming, Scuba Diving and Wind Surfing are other interesting activities. Gliding, Micro lite Flying( generally ZENAIR CH 701 STOL AC) and attachment training with Airforce Stations/Establishments are the main activities. 100 Pipistrel Virus SW 80 on order. The aim of YEP is a country-to-country exchange of cadets belonging to NCC/equivalet Govt/Youth Organisations of friendly countries and participation in various activities and appreciation of each other's socio-economic and cultural realities.More than 100 cadets proceed abroad on YEP annually. ^ "Size of NCC" (PDF). ^ "Handbook NCC" (PDF). Directorate of Tamil Nadu. ^ "Paramilitary Forces of India". Mr.M.C. Sharma. ^ "Motto of NCC | National Cadet Corps". nccindia.nic.in. ^ "AIM OF NCC | National Cadet Corps". nccindia.nic.in. ^ "PLEDGE | National Cadet Corps". nccindia.nic.in. ^ "Directorates" (PDF). Government of India. ^ "RTI application" (PDF). NCC, India. ^ "Republic Day Camp (RDC)". NCC. ^ Malyasov, Dylan. "India Will Buy 194 Virus SW 80/10 Microlight Aircraft from Slovenia". defence-blog.com. Retrieved 7 August 2016. ^ The Financial Express (12 October 2015). "India inks Rs 130-crore deal for 194 microlight aircraft". financialexpress.com. Retrieved 7 August 2016. Wikimedia Commons has media related to National Cadet Corps (India).